An orangery is a structure dating from medieval times. 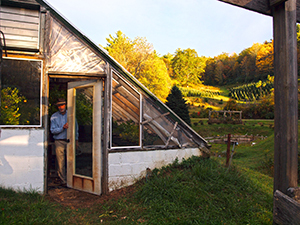 It actually precedes the invention of the greenhouse. Early orangeries were made of stone and had few windows. Serfs heated them with pans of charcoal. As technology of glass making improved orangeries came to resemble a modern greenhouse. Functionally, they are quite different. In medieval times, oranges and lemons were a great luxury. Only the aristocracy had access to these strange and delicious fruits. Manor houses in Northern Italy, France, Germany and England had many out buildings and one of them was usually and orangery. 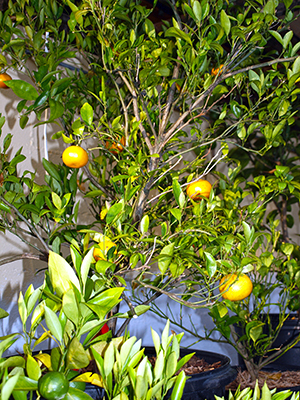 An orangery differs from a modern greenhouse in that its contents- the orange and lemon trees, are removed and kept outside as soon as the danger of frost is passed. The trees are kept in large but moveable containers. Periodically the roots are trimmed back so that these trees may live for over a hundred years. Orange trees from the Versailles palace in France still exist that were tended by King Louis the Fourteenth. 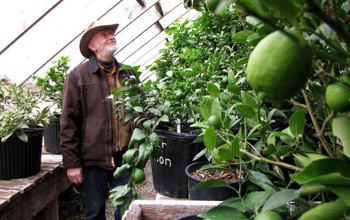 The orangery at Swinging Bridge Farm has over forty citrus of various species. The building itself incorporates many unique features designed to minimize heating costs and disease. It is built into the side of a hill. Gravity water from our spring runs a double fan system with no use of power from the grid. Another fan pushes hot air from the top of the orangery down into a rock storage area where it provides heat during the cold mountain nights.